For further details about our new products, please see below or download the PDF brochure at the bottom of the page. Thorn’s ceiling luminaire for workplaces can now be surface mounted or suspended, creating a comprehensive family of fittings. The family of luminaires share the same comfortable, glare-free illumination and sleek, simple look. More powerful, more flexible, and ready for the smart cities of the future. With Alumet Stage II, Thorn’s Alumet family takes a leap forward. The family of Thor offers a selection of smart urban lanterns and bollards for numerous applications. The combination of smart controls and special optics ensures an excellent balance between performance and comfort within the whole family. Our new gimbal-mounted spot completes the Tonic family of high-CRI luminaires for retail. Installation is simple, thanks to Thorn’s unique “flag” system, which ensures a secure connection to the ceiling with no slipping. Tonic Gyro helps designers create consistent interiors. With its classic tubular look, the recessed gyro-mounting keeps ceilings uncluttered. The colour-rendering index (CRI) of over 90 makes Tonic Gyro ideal for retail applications. Thorn’s decorative suspended Glacier II LED now offers more flexibility, with a variety of new options and decorative choices. The new design and specialised optics make the new Piazza II LED a champion of outdoor lighting. The precision optics limit the Upward Light Output Ratio (ULOR) to 2.5% which reduces wasted light and light pollution. 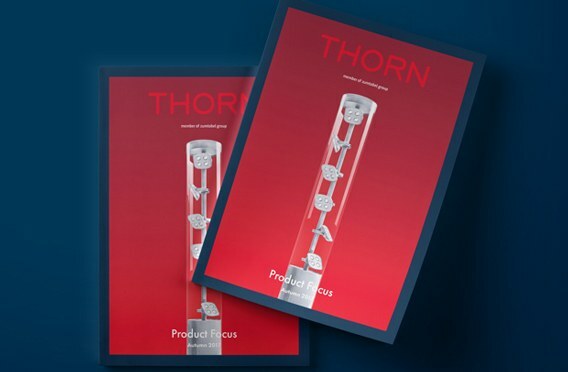 At just 37 mm thick, the new Voyager Style luminaire is unobtrusive, ultra-slim and the perfect addition to Thorn’s growing range of emergency lighting. Voyager Style is rated IP43 for protection against dust and moisture, making it a versatile solution. The new LED bulkhead offers high-performance, universal LED emergency Lighting. Available in small or large versions with a consistent design, Voyager Solid provides even, homogenous light distribution. The super compact and new LED emergency luminaire is ideal for installation in ceilings. Voyager Fit’s light output allows for units to be spaced wider apart, which makes the solution highly energy-efficient.